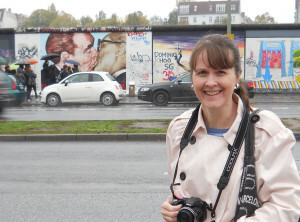 Can it really be 25 years since the peaceful fall of the Berlin Wall? The city itself has been paying tribute to the event this weekend with lighted balloons placed along the entire path where the hated wall once stood. 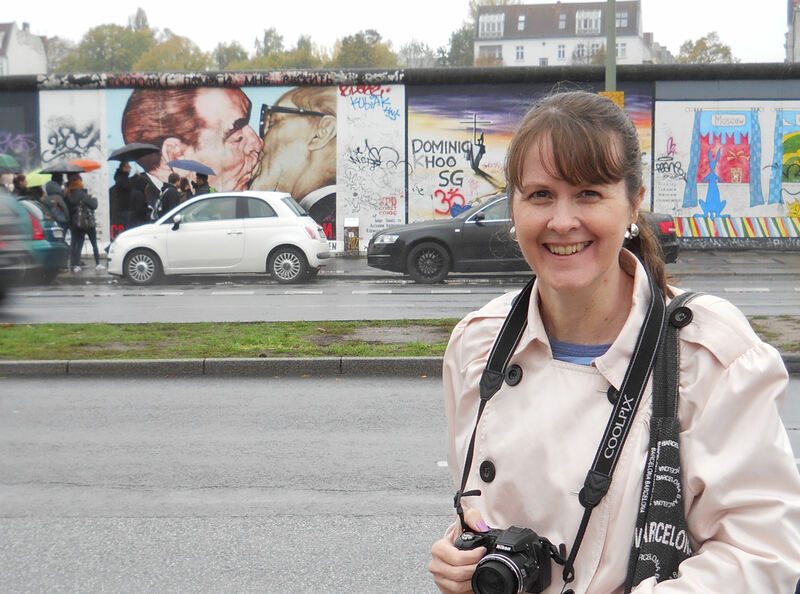 We were in Berlin just 3 weeks ago; and getting up close to parts of the wall still standing was at the top of my “must see” list. 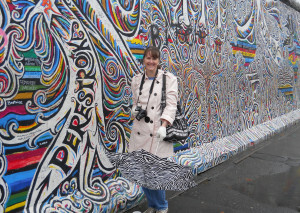 We had seen pieces of the wall dotted along the city while on various tours and at exhibits, but I most wanted to get a chance to walk alongside the East Side Gallery. This concrete canvas is considered an international tribute to freedom. The longest existing piece of the original wall, it runs 1.3 kilometers (or 0.8 miles). 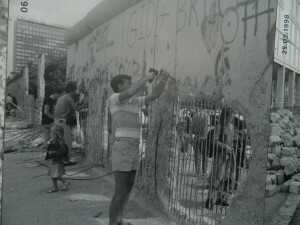 During the many years that the wall was up and patrolled, the west side was consistently covered in graffiti. But because of the constant watch on the east, that side remained gray and clear. That was remedied 1 year after the official opening of the wall at this locale on Mühlenstraße (Miller Street). 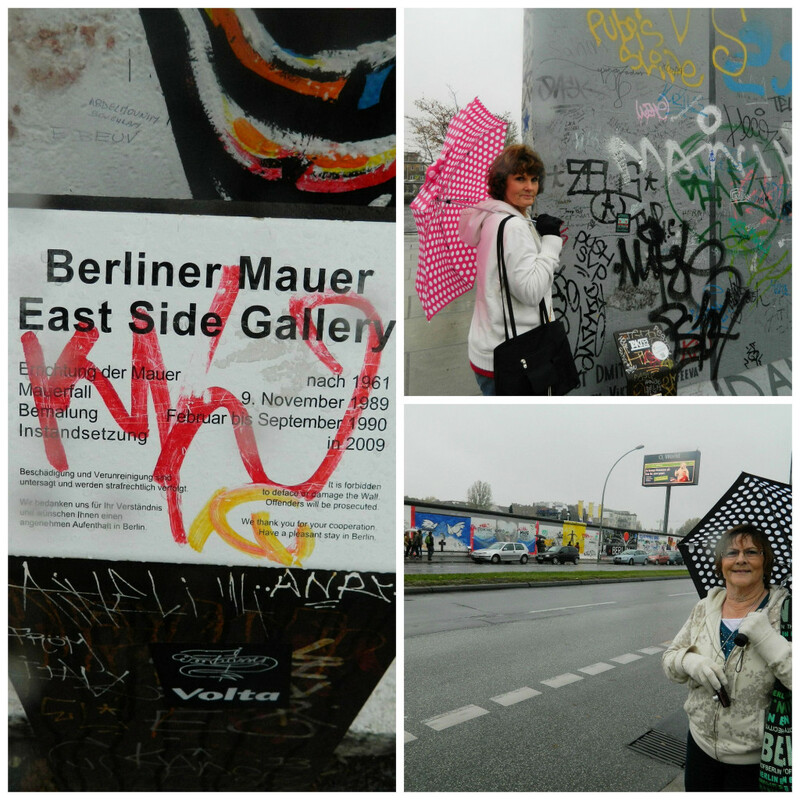 The East Side Gallery has 105 paintings that were created by artists from all over the world starting in 1990. And it’s considered to be one of the longest-lasting open air galleries ever. 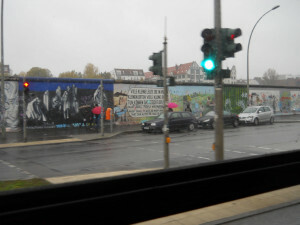 But just then, the bus rolled up to the East Side Gallery’s most famous spot (more about that later) and I knew I couldn’t NOT see this up close. So I jumped off into the downpour, hollering to my family that I’d meet them back at the hotel. But as the bus pulled off, they were standing there beside me. We were 3 women shivering under umbrellas but wearing huge smiles. What can I say? This was the very definition of something not to be missed. 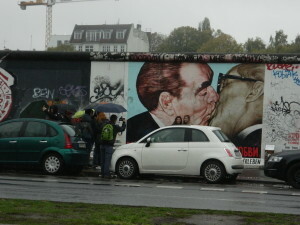 Now, about that famous spot: It’s known as (painting #25) “My God, Help Me to Survive This Deadly Love” and is a painting of an actual photo taken in 1979 during a traditional “fraternal kiss” between Russia’s Leonid Brezhnev and East Germany’s Erich Honecker. This painting has pretty much become the face of the Gallery and has been recreated on everything from posters and mugs and t-shirts to advertising campaigns. Of course all of the artwork, with most depicting hope for a better future for all people, were fascinating. And although at one point I could no longer feel my toes, I still loved my walk along this colorful piece of history. While Germany is celebrating the wall’s fall today, I am grateful to have been able to see the site and hear the stories closeup. 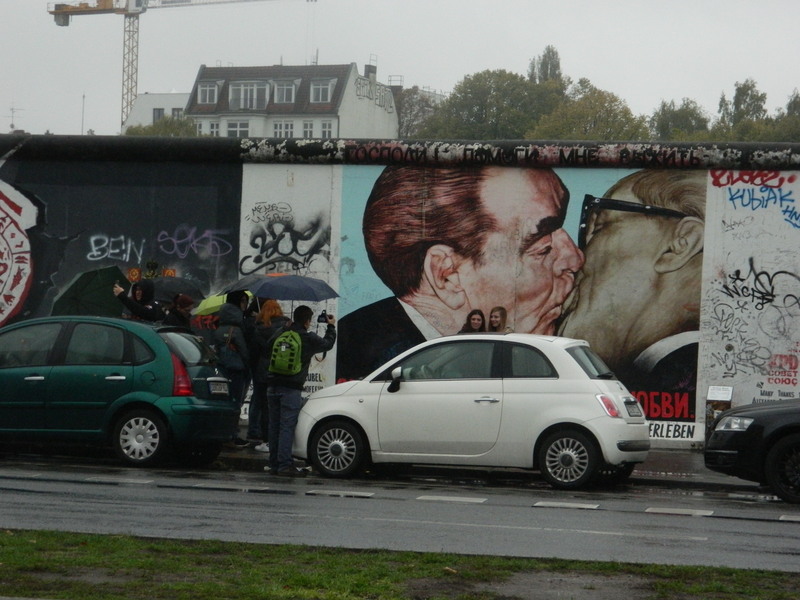 Happy 25th Anniversary Berlin! Being in Berlin and touching the Berlin Wall, is something I will never forget. As I touched it, I found myself feeling so sad for all those people separated from their loved ones and how scared and sad they were. But then to rejoice when the wall came down. To be there today and see all the balloons lining the entire path where the wall stretched across Berlin would have been awesome. Great story Deborah. Thank you for sharing. You’re welcome! And you’re right — being around all that history really is quite an experience. Thanks for stopping by! This is an awesome write up Deborah. Is was such a wonderful feeling to actually get to touch the Wall. 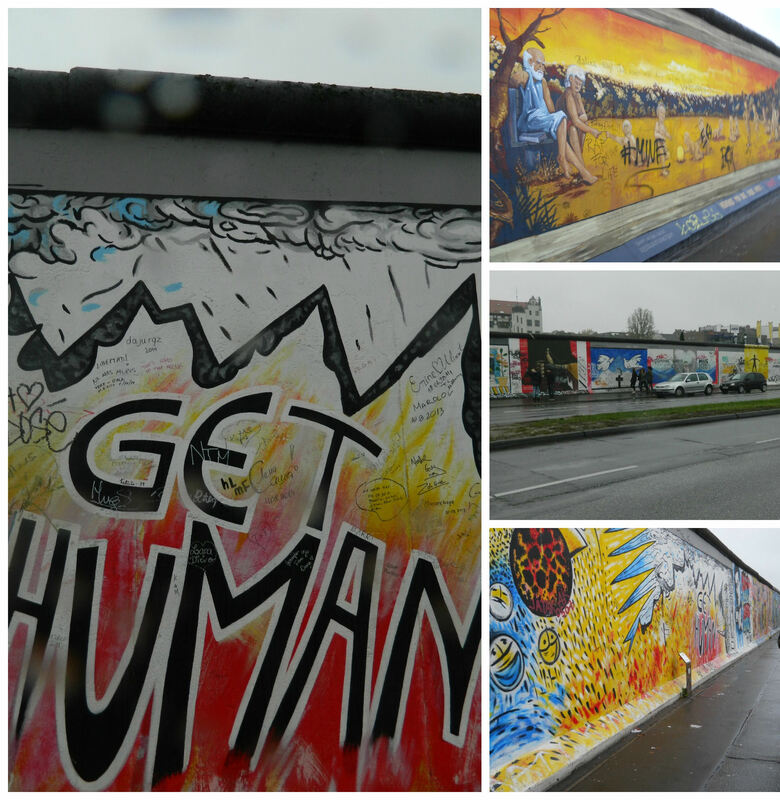 So much history in Berlin, and I’m glad I got to see all of it. Would have been great to see all the lighted balloons, but nothing can take away the memories of seeing and touching the Wall. I was not aware the entire wall left standing had all those graphics on it. Nice story and wonderful pictures. Thanks for writing about this. What an adventure! I hadn’t realized the section was so long. And soooo interesting. Glad you liked the write-up! Very cool! I remember when the wall came down, and the huge shock it was. Thanks for sharing your experience. I remember too Laurie. Seems like a lifetime ago. Great post, Deborah! Thanks for reminding us of hope after totalitarianism. It helps. I remember when the news reported the wall coming down. I could not believe it. However, it was and is true. Anything can happen and we need to know that! Great points! It was fascinating to see how the different artists interpreted the idea of freedom. I feel honored to have had a chance to see it. Having lived through the seemingly endless years of the “Cold War”, I was surprised by the sudden détente among the governments of West Germany, Russia and the USA. 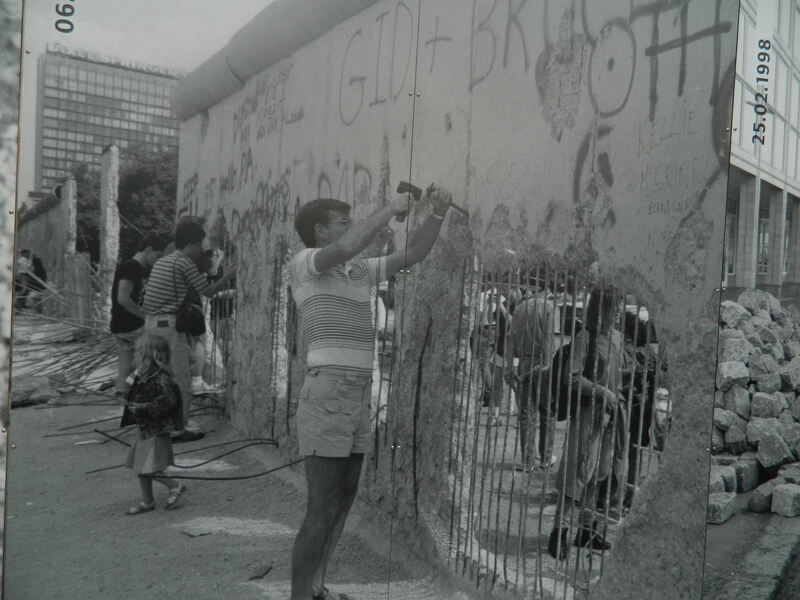 The “fall” of the Berlin Wall was the happy culmination of détente and was celebrated world-wide. Last week, I also celebrated the 25th anniversary of the that fateful day. Thanks for your beautifully written tribute, Deborah.